I forgot how soul-sucking winter is. Maybe I purposefully blocked it out. The only mental note I seem to have left for myself from last winter was “plan a warm vacation for February or March, you’ll need it.” And I did that, we’re going to Ecuador in March and I can’t wait, but still: soul-sucking. The cold has turned my usually pleasant 15 minute walk to the subway into 15 minutes of breath-stealing torture. The other day my breath was actually freezing on my eyelashes and then melting onto my face every time I blinked. The other Bostonian commuters and I have been reduced to a pair of eyes surrounded by layers of black wool, and that small open part of my cheeks that my scarf doesn’t cover are perpetually windburnt. So even though we try our best to stick with root veggies and dried beans and hearty winter greens in January, last weekend the only solution to the cold was to turn to fantasy, and go all out with tropical flavors. Two mangoes, one papaya, and a whole pineapple later, we were successfully pretending that we live somewhere with greenery, sunshine, and brightly-colored birds. 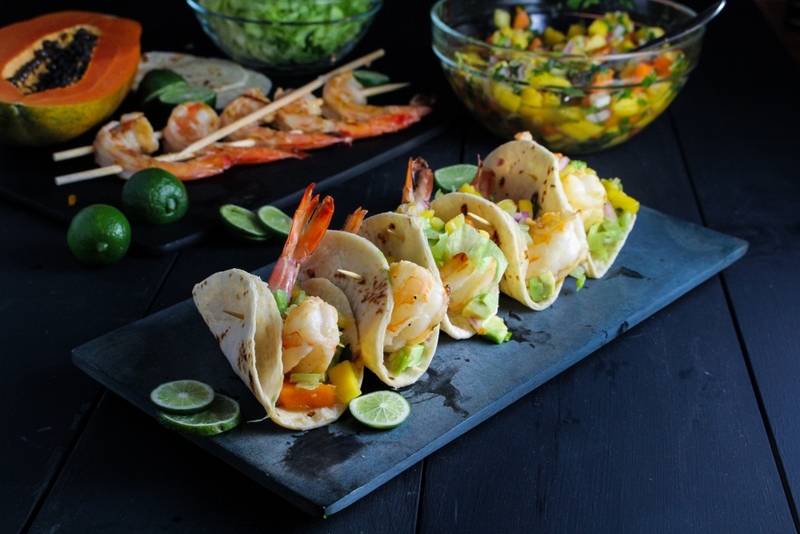 These Mini Shrimp Tacos are our contribution to the Superbowl edition of the Captain’s Table Challenge. They’re glazed with Captain Morgan’s newest product, Captain Morgan White Rum, which is lighter and slightly fruitier than their spiced rums. The glaze also has honey, lime, bell pepper, and smoked paprika, for a pleasant mixture of sweet, tangy, and smoky. 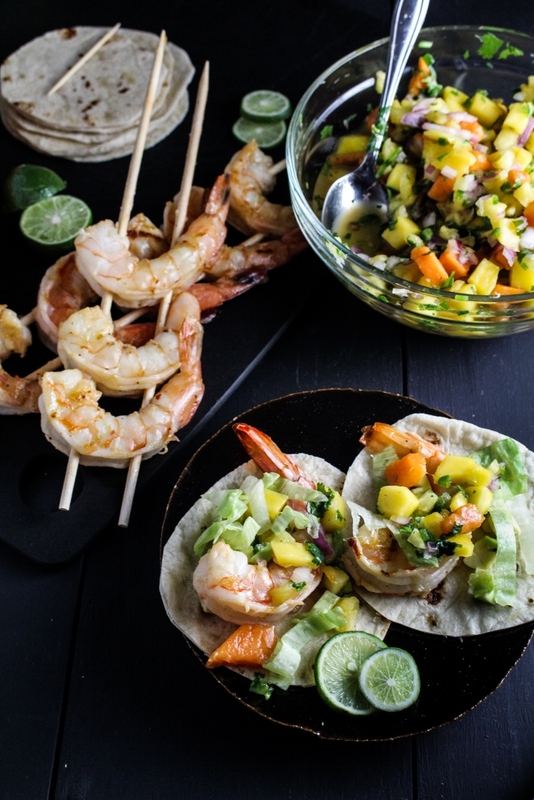 Wrapped in mini tortillas and topped with avocado, lettuce, and a bright pineapple-papaya-mango salsa (that also has a bit of rum in it for good measure), they’re great football-watching finger food that will also help cure your winter blues. 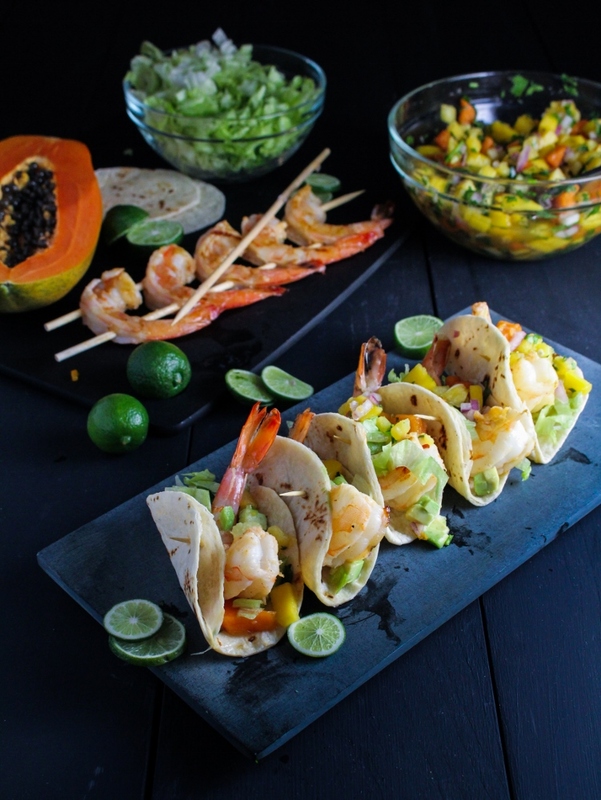 For anyone who’s been stopping by here for a while, you might have noticed that these tacos have the honor of being the first seafood recipe I’ve ever shared on this blog. Yep, the 1st post out of 333. I’ve never been much of a seafood-eater (in fact, as my parents can attest to, it absolutely disgusted me as a kid), but the past year or so I’ve been trying to get myself to come around to it. I can honestly say that I like smoked salmon, but shrimp is still a bit of a stretch – I ate one of these and liked it OK, but Trevor did some leftover shredded chicken in the same rum glaze, and that was much more my speed. Still, it’s progress! 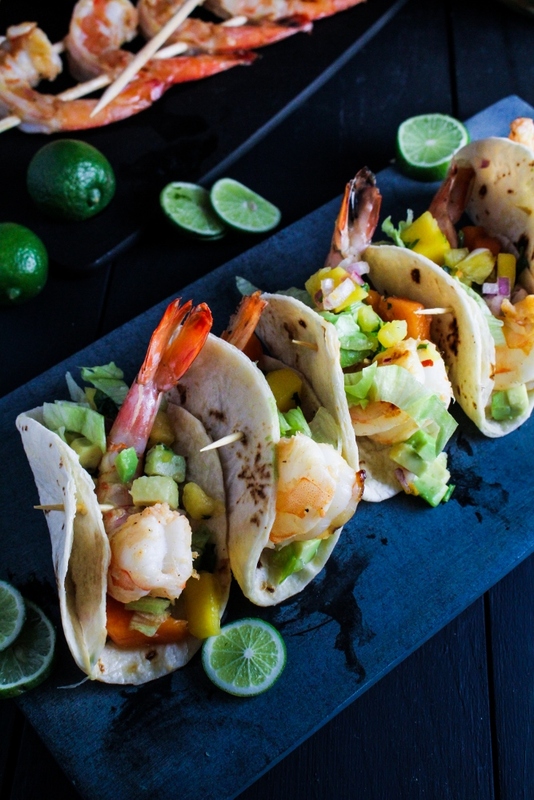 But whether you make these tacos with shrimp or chicken, for a football party or for sitting on your couch at home and watching rom-coms, I promise they’ll be a bright spot in your week. Preheat your grill or pan to medium-high heat. 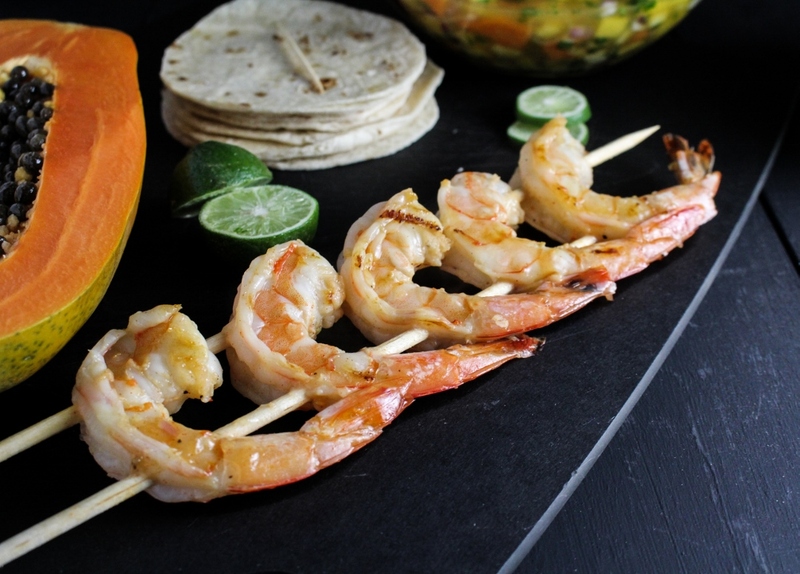 Take the shrimp out of the refrigerator and skewer them (this isn’t strictly necessary, but I find their easier to handle this way), reserving about a cup of the marinade. these look delicious and i will be making them ASAP. I never thought to make mini tacos for a party, what a great idea! These look great! These look so lovely and light … but so tasty as well! As for the cold, it’s chilly here in the UK, but nowhere near as cold as you’ve had it over there. Stay warm!! oh my goodness. these look amazing. remind me of the beach and make me long for my upcoming honeymoon.